Passion flower (Passiflora caerulea) is a sturdy, fast-growing vine that will happily wind around a fence, trellis or arbor. Masses of showy, creamy white and blue blooms will appear on the passion flower vine in early summer and will continue into autumn. If you're looking for additions to a butterfly garden, passion flower is a perfect choice as butterflies are attracted to the colorful flowers. In autumn, the blooms will be replaced by bright orange fruit. To propagate a passion flower vine, take stem cuttings in late spring or early summer. Fill a container with a mixture of equal parts sand, perlite and peat moss. Any container with bottom drainage will work. Set the container in a saucer of water and allow the potting mixture to wick water through the drainage hole until the potting mixture is damp clear through, but not soggy. Cut several 4- to 6-inch tips from a healthy passion flower vine, using a clean, sharp knife or garden pruners. The stems should be at the softwood stage, which means that they should break with a pop when you bend them. If the stems bend but don't break, or if they are so woody that they won't bend at all, the shoots aren't at the softwood stage. Strip the leaves from the bottom half of the passion flower stems. Roll the cut end of the stems in powdered rooting hormone, and plant the stems in the container. It's fine to plant several stems in the same container, as long as they aren't touching. Spray the potting mixture lightly to settle the potting mixture around the stems. Put a clear plastic bag over the container and secure it with a rubber band. If necessary, place some wooden sticks in the container to hold the plastic away from the cutting. Place the cuttings outdoors in the shade. The cuttings should root in three to four weeks. Check the cuttings every few days, and mist inside the bag if the potting mixture feels dry. Once you notice new growth, tug lightly on a cutting. If you feel resistance, the cutting has successfully rooted. Plant each stem in an individual pot, with no plastic bag. Keep the soil moist. 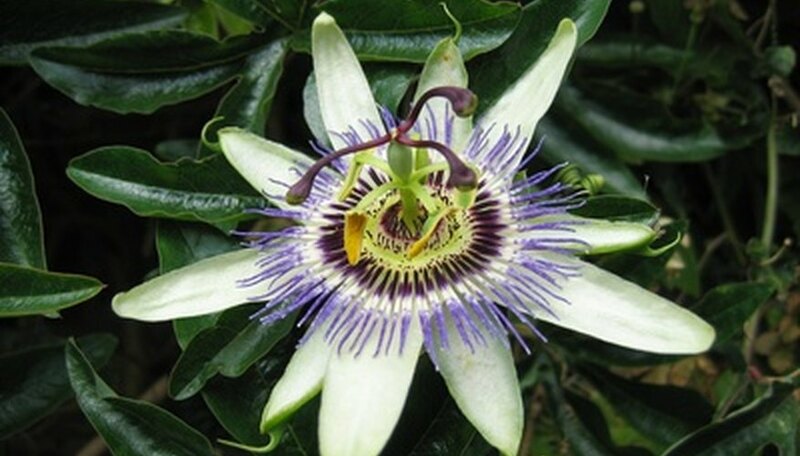 Allow the roots to grow a few inches longer, then plant the passion flower vines in your garden. The larger the plants are allowed to grow, the better chance they will have of long-term survival.